Focus on the garden. We’ve got the bugs. When unwanted insects threaten your garden fun, turn to simple control you can trust. 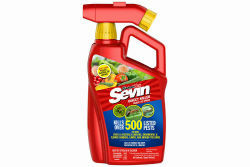 Sevin® Insect Killer Ready to Spray kills more than 500 insect pests by contact on ornamentals, flowers, vegetables and fruits, as well as in lawns and around your home's perimeter. Protects over 250 fruits and vegetables. Won't harm plants, blooms or lawns. Connect a garden hose to the ready-to-spray concentrate's container for automatic measuring and mixing, minus the mess. Then relax while it keeps protecting for up to three months,(Except Ticks) so you can enjoy your garden at its best. Use at the first sign of insect pests or where they are expected to appear. Shake well, with the control knob in the "Off" position. Attach a regular garden hose, and then turn on water to the hose. Take aim at target pests, plants or treatment areas, and turn the control knob to “On." Spray evenly and as directed for the type of treatment area. Spray plant surfaces, upper and lower, until thoroughly wet. Do not use on tall trees. Consider hiring a professional for trees taller than 10 feet. Spray on calm days when no rain is forecast for 24 hours, so spray won't drift or wash away. Follow recommended intervals between spraying and harvesting edibles. Start spraying large areas at the farthest corner and work backward, so you and the hose avoid contact with spray.